I took this picture a few months ago when I went to Crundale. I keep finding myself asking about the vegetation. Did it find its way through itself or is it a cutting? how pretty and effective by being simply decorated. Pretty window, I love the soft rainbow colours! 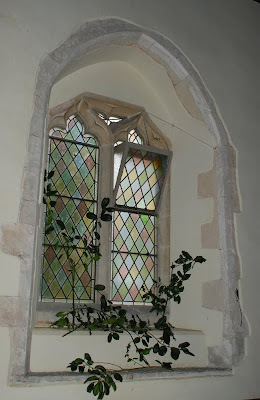 I really like this simpel photo of a beautiful window. Well done. Btw thanks for the nice comment on my blog. Such a beautiful window. Just love it.